Hindi Lyrics 4 U: Lyrics Of "Nindiya (Cover Version)" From Latest Album - Nindiya (Cover Version) (2016). Lyrics Of "Nindiya (Cover Version)" From Latest Album - Nindiya (Cover Version) (2016). A lori song sung by Jonita Gandhi and music composed by Shashi Shivam. The video of this song is available on YouTube at the official channel T-Series. This video is of 2 minutes 37 seconds duration. 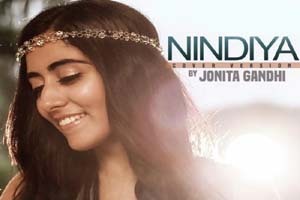 Lyrics of "Nindiya (Cover Version)"